Quick Guide for the Oppressor. How to Get in to the FIB Building (Freemode). How to Get in to the Fort Zacundo Without Stars / Enemies. Advanced Guide for MC Business. The main part of the update, the Hangar is where magic starts to happen. Under magic, I mean new aircrafts and customization. First of all, you get to choose 1 out of 5 available in 2 areas - LSIA and Zancudo. As with the rest of the facilities, location doesn't affect contents. However, there're 1 exception here. Zancudo hangars grant you access to airspace of the base meaning you won't get wanted level and soldiers won't attack you when you land there. However, shooting one of them will still give you 1 star and make them hostile. Stealing a Lazer gives 2 stars. I say it's still kinda great to have ability to fly and walk around in Zancudo, for only 500k extra over LSIA hangar. Essential upgrade you must get is the Aircraft Workshop for 1.15M. Why? Hangar is pretty much pointless without planes customization option. And yes, price for that is that high. Forgot to mention that most of the new planes come completly unarmed and just buying the planes won't get you satisfied. Buy the Workshop before any planes. Alright, so suppose you got your hangar with Workshop. What now? First of all, you're greeted by "russian hacker" jokes from Ron and a tour around the place. Then you're given a "new" version of Cuban 800 with ability to drop bombs when upgraded. You have access to UNLIMITED storage for planes and a showroom worth 12 slots. What are slots? Basically, aircrafts are separated into 3 sizes: small, medium, large. Don't fear you're limited on space however, these slots are just for showing off and any other aircraft can be placed into the storage. Here's a video showing how slots work. All the vehicles stored in the hangar are considered personal and can be requested through M-menu (interaction menu). All of them will have additional spawn points, so you won't need to travel to nearest airfield to pick up your plane. It's also worth mentioning that ANY Pegasus aircraft you own can be put into your hangar. You'll be able to request non-custom aircrafts through Pegasus even after they're turned into a Personal Aircraft (PA). Customization of old vehicles is only limited to colors, however. If your PA is destroyed, call Mors Insurance to return it to hangar for only 1 grand. Hangar also grants access to a new type of business with hella cool supply missions. You get to choose 8 different types of contraband, but don't start sourcing them randomly as soon as possible. You get money bonus for stacking up crates of one type. Initially, each crate is worth 10k, but there's a difference in bonuses between some of them. 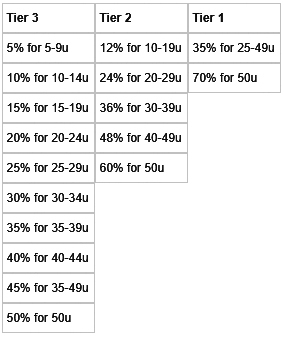 Below you'll find a table with those bonuses, where % is the bonus and x-y u(nits) is the number of crates needed for that extra cash. Calculating exact numbers for money/hour is impossible due to the difference in missions' length. I'll give you rough estimates for different amount of players in organization. Solo, it'll take 10.5 mins for mission and 2.5 min cooldown, you'll get 50-75k per hour depending on the bonus you receive (table above). Absolutely horrible numbers. With 2-man crew - 9 mins for mission and 3 min cooldown, you'll get 100-150k which is still bad for "active" income. With 4-man crew and same mission time, but 4 min cooldown (it does increase with more ppl in organization), you'll get 160-260k per hour, which is already good. Take in mind, that to get maximum profit, you'll need friends to do missions with, potentially very poor or very rich. Unlike previous investments, Hangar pays off with friends. I highly suggest selling in empty sessions. Sadly I lost half of my 800k take just because 1 of 6 containers during Cargobob selling was destroyed. Ultralight and Bombushka (always 1 plane) missions appear only when selling not alone. A simple mission where you're given a Hunter and a dozen of targets around the map. Get in the heli and use Barrage rockets to destroy each jammer. After all of them are down, your target with supplies will be revealed. Use the same rockets to destroy it and pick up the cargo. Attackers after you steal: 2 Buzzards. You'll be asked to protect the cargoplane until it reaches the drop point where you'll get your cargo. There'll be buzzards attacking it - they don't deal too much damage, but enough to destroy the plane if you don't kill them. A rather frustrating mission to do alone with the provided Mogul due to its fixed low-DPS gun. I suggest taking some plane with lock-on rockets or even a heli because the speed of the Titan is lower than the Ultralight's glider - about 12m/s. One of you takes the control of a Maverick, the other shoots. You're also provided with MK2 Sniper rifle with suppressor and thermal scope for this one. Getting hits can sometimes be hard and not worth the effort, it's easier to land the heli and do it the loud way. Attackers after you steal: none if silently, 2 Buzzards if guards were alerted. You're provided with an unarmed Buzzard - fly to the point and land where shown. You'll find some crates there - shoot them to open. Of course, there're enemies but they shouldn't create much trouble. Don't be afraid of dying - you'll respawn where you landed your heli. Take a Howard - stunt plane and show your precision skills. This missions is favorable for those in LSIA because of more stunt locations in the city. But it's possible to complete it even without going to the city. After the "Excitement" bar is full, the location of Mule with supplies will be shown on map. You can either drive it or destroy it to pick up cargo on your own. Take a Rogue equipped with machineguns and bombs and drop some explosives on rooftops. It's much easier to do so with a 2nd guy cause you'll need to worry only about piloting or dropping bombs. When there're no enemies left at all locations you'll be shown a location of unarmed Buzzard with supplies. Take an unarmed Buzzard and fly to the search zone to look for crates. Crates emit blipping sound and they also flash - it's really easy to see them from 500 metres. Enemy helicopters spawn after you kill the survivor/get within a couple metres of the cargo. Pick up the cargo and go full speed. Get aboard the most expensive plane from the update - Tula - and fly out to the ocean. It's equipping with JATO, bombs and dual machinegun turret. You'll need to do a couple of bombing runs on enemy fleet of boats and barges before landing your plane on water. Ron has provided you with 4 rebreathers each, so dive and pick up the cargo - you got more than enough time. If you're doing it with friends, tell them to be fast because as soon as you pick up 1st crate enemy helis will appear. Try to shoot down helis until you've taken off using JATO boost. No aircraft provided, reach the destination and get rid of the enemies surrounding the plane (Rogue or Pyro). Even though the plane can take some damage, use explosives is very much unneeded. Take a blacked-out Cargobob and fly high up in the skies to parachute down to the target (Humane Labs, Bollingbroke Jail, more?). Land at the marked area and start killing the guards using suppressed weapons. Note that if 2 guards look at each other, you can kill them using 2 shots, but the delay between them must be lower than 1 second or you will be spotted. Take Molotoks and fly towards the marker - 3 single-player cargo jets will be flying in a straight line with about 10 Lazers escorting them. Obviously, focus the small planes first since they're more dangerous. Despite you being outnumbered this is rather easy, just be careful not to crash yourself into one of them. When none of fighters remain in the air, start spamming rockets at the big planes. 1 of Cargo jets will drop the cargo you need when destroyed, so the crates will be slowly parachuting down - enable maximum precision and catch it like a bird catches a fly. You're given a Nokota to get rid of some Lazers. Scenario is almost the same as for the mission above, but once you destroy first bunch of them, more will appear. You source as many crates at once as many people there're in your organanization - 4 max. You can destroy the vehicle your cargo is in and pick it up on your own. If there're multiple crates in 1 mission when playing with friends, they'll have to do it too. For most missions you can use your own vehicles and ignore those that are provided, however they usually work the best. Almost any aircraft is faster than AI helis chasing you - don't bother fighting them. If you got locked on by AI planes, make a quick 360-spin. Rocket won't even pass close to you. Controls - a normal single-propeller plane, easy to handle. With gear down becomes turning becomes way slower, so align it to the landing strip before extending chassis. Opinion - my first and probably best purchase out of all aircrafts. It has like everything - rockets, explosive (yet slower firing) short-range cannons, bombs, countermeasures, even a passanger seat. Nearly a must-have. A rather outdated plane with not so outdated equipment. Controls - simple jet, nothing special about it. Engine upgrades allow it to be faster than the rest of the planes. Opinion - I was fairly disappointed with this one just from trying friend's plane. Yea, it's a jet with old interior, but it has no functionality for such price. Non-explosive low-damage cannons, simple rockets and countermeasures and no VTOL. For 3.6M you kinda expect more. Pre-war quad-engine plane with vertical takeoff and landing on water. Controls - slow and massive old plane, with VTOL mode and JATO thrusts. Obviously, its not agile enough to be called a fighter plane. Opinion - another hugely overpriced vehicle. It won't win you battles, but if you need to be able to land everywhere, it's the one for you. Paraglider, first of its kind. Controls - it's not made for speed. Turning can be a little complicated at first, but doesn't take long to get used to. Opinion - cheapest vehicle from the update, and I'd say not the most useless. Carbon propeller upgrade allows you to be sneaky and installable minigun might come handy a few times. One of the oddest german creations. Controls - this plane is only powered by rechargable boost. Incredibly hard to control when boost is engaged, yet glides easily. Opinion - I have no idea who approved this plane. Real-life prototype (Me 163 Komet, read about it if you want) works in a completly different manner. Some might find this mechanic interesting, but not me. And the price tag also stops me from buying it. Opinion - unless you really want to try out this fun little machine, wait for discount. Minigun upgrade won't get you anywhere. Controls - unlike heli alternative - Havok, controlling this one is way easier. Opinion - but the price tag is still too big. No weapons available. Titan how it should have been. Controls - it's as big as it's slow and unmanoeuvrable. Obviously, it's not for stunts and you should expect to fly it in the manner of real-life planes. Opinion - despite it's size it's rather fragile (3 explosive sniper shots or ~2 secs of hydra fire). Your crew (because you won't be able to shoot yourself) has to shoot before you're shot at. As a pilot you only can get into top and rear turrets while grounded. At its current price I can only recommend it to those who really have nothing else to buy and look for unique things. Controls - Similair to the Alpha, yet it seems a little more stable and easier to land cause of raised front gear. Opinion - If you want a stunt plane but not ready to give extra 600k for a smaller "version", this's the plane for you. Overall, a good investment for getting you from point A to point B. Controls - by no means a fast plane, somewhat similair to Cuban, but less maneuvrable. Opinion - I really can't find a proper use for this one. Both weapons aren't strong enough to counter player-controlled vehicles, may only be enough for NPCs. Controls - really enjoyable, sharper than last-gen jets, but not as sharp as Rogue's. Opinion - Pyro might be my favorite plane along with Seabreeze in terms of looks and casual flying. For those who want to dogfight with it, it offers better top speed and quicker turning than Hydra/Lazer and countermeasures while trading explosive cannons to rather powerful machineguns. If you're still not sure, wait 25% discount and it will be a great purchase. Controls - very smooth handling that you should upgrade unlike the engine. With max level of it, the plane becomes as fast as Alpha or Howard. Landing on sea is much easier than Dodo - you can literally slam into the water under 45 degrees without damage. Opinion - it may seem like a fragile toy, but when armed with machine guns (which are identical to those on Pyro or Molotok) and bombs it can cause some trouble both to ground targets and planes. Needless to say, the pilot must be experienced enough to do so. Worth the price. Controls - nothing special here, it's not as fast as Molotok or not as nimble as Pyro. Opinion - if you're looking for a cheaper alternative to the 2 aforementioned planes, it's the one for you. Controls - pretty much like a buzzard, note that engine upgrades exchanges horizontal speed for vertical. Opinion - if you got a friend and money to spare, get this instead of Hydra. Bigger buzzard with Valkyrie front gun is a hell of a deadly combo. These can only be applied if you have Workshop in your hangar. Upgrades that can't be put together at the same time are put at the bottom and separated from the rest by an empty line. These are shared between all new planes and helis. Engine - increases top speed and accel by A LOT. Livery & Respray - aesthetics. Handling - more expensive options give you sharper steering and quicker response. Not recommended for keyboard players. Flares - destroys incoming missles. Note that distance between you and the rocket must be rather short for them to work. Use back view to see it. Chaff - blocks any incoming missles for 6 seconds. Colored Smoke - leaves a long trail of smoke, better for airshows use rather than safety. Bombs - not available on some planes. Read below where they can be put. Incendiary - smaller explosion radius, but leaves fire on the ground. It might only come handy when your targets are stationary and on fields of grass. Cluster - slightly smaller explosion radius, but drops a couple of small explosive pieces after each explosion. Not much of an improvement over stock, but might come handy against armored vehicles. Homing Missles - those like on Hydra, also not available on all of them. Machinegun - a rather weak thing, but still better than those you get on Ardent or Nightshark. Turning angle is over 270 degrees. Extended Propeller - faster top speed and accel. Carbon Muffled Propeller - a very interesting and possibly useful upgrade that allows you to go Off The Radar when the engine is running on low RPMs or is completly shut down. Glider's weight allows it to stays in air for long without extra thrust applied. Appears to be working even if you carry cargo for any of your businesses. Comes by default with body-mounted Machineguns. Drop Tanks - cosmetic, it seems. Machinegun - about the same damage as on Ultralight, but due to being fixed becomes nearly useless. Comes by default with wing-mounted Machineguns. Rocket Boost Upgrade - improved recharge ratio and capacity of the boost the plane is powered with. Jato thrust - similair to the boost on LF-22, it allows to take off faster. Note that without VTOL engaged it's impossible to take off from water without these. 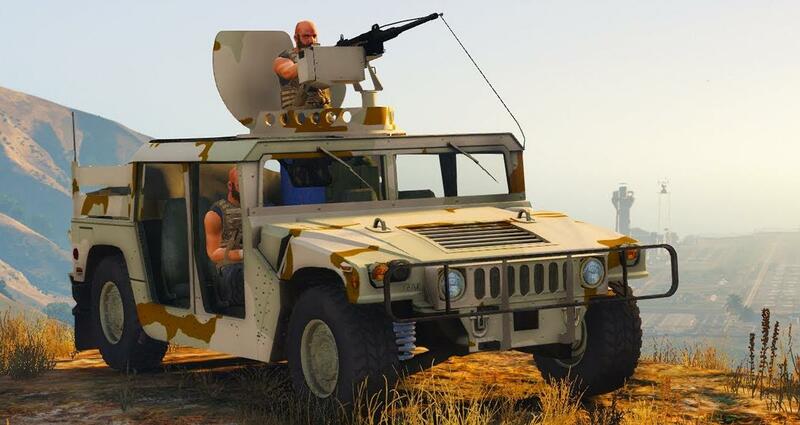 7.62 Minigun Turret - similair to the one on Turreted Limo and Technical Custom. A better choice for close-range. Explosive Cannons - not Hydra-fast firing rate, but explosives are always better, right? Comes by default with 3 turrets covering everything by 360 degrees. Dual explosive turrets x3 - despite being named "Dual" these have slower fire rate than Valkyrie at about 60 RPM and the same short range. Needless to say, they won't allow you to spam from 1km altitude. Comes by default with single .50 cal Gunner Turret and single body-mounted machinegun. Not a plane, it's the batmobile thingy. No liveries here. Driving Capabilities - how you expect them to be. Fast, grippy and aiming for the place among top supercars. Opinion - this one is for ultra-modern car enthusiasts, but those who don't know much about cars will still find it useful for racing. Driving Capabilities - stiff suspension gives it some advantage on asphalt, but still not enough power to compete against more "sportier" classics. Visual Upgrades - just like the real-life car, it's all about rally. Plenty of nice liveries. Opinion - another sought-after rally legend, if you're into that sport it's a must-have. Driving Capabilities - electric engine, thus no gears and the strongest acceleration ever. Putting a spoiler on recommended as it turns quite bad. Opinion - another novelty supercar for too much money. Buy it if you feel like doing so. Visual Upgrades - truckload of them, most of them are made for ♥♥♥ tho. Opinion - A solid car for the price, go for it unless you think that it is a ""mustang""
Turning GTA into Saints Row again. Driving Capabilities - weight is about the same as Insurgent's, yet it's pretty fast and has a rechargable boost. Ramming like an Insurgent. Rather unbalanced in this aspect. Visual Upgrades - none. At all. Opinion - you'd expect it to be indestructible, but it's rather fragile. Carries 20 missles Ruiner-like missles if upgraded at MOC. For the current price it's absolutely not worth it.